UPDATE 25/11/13: DUE TO CIRCUMSTANCES BEYOND OUR CONTROL THIS EVENT HAS BEEN POSTPONED UNTIL FURTHER NOTICE. ALL RSVP GUESTS WILL BE CONTACTED AND ANY MONEY PAID REFUNDED IN FULL. Independent Australia is having a party in Sydney at the end of this month and we want you to be there. 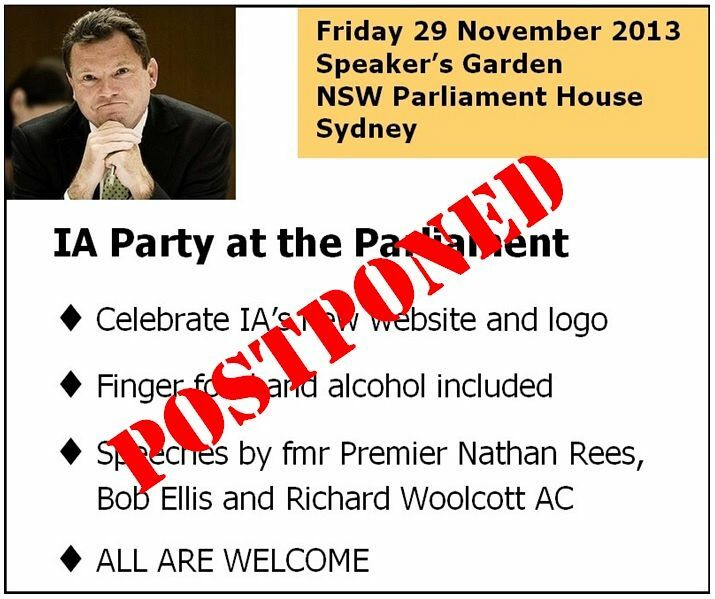 To celebrate the launch of IA's new website and logo, IA is holding a get together in the salubrious Speaker's Garden of the NSW Parliament on Friday November 29, from 6pm (for a 6.30 start) until 10pm. The event will feature an address by former NSW Premier Nathan Rees and will include other high-profile speakers, as well as raffles and prizes. Finger food and drinks will also be provided. Please RSVP to editor@independentaustralia.net by Friday 22 November. You can also RSVP by phoning or texting 0403 237 880 with your details. Full price Tickets are $100. (If you are on benefits or a full-time student, tickets are half price.*). You can pay for them by depositing money in the IA bank account (A/C name: Independent Australia; BSB: 124-001; A/c no: 21890458) with the reference: "NSWevent" along with your name. Please support IA and independent journalism by having a great night out in the city in one of the last few days of Spring. UPDATE 2 - 15/11/13: Half price tickets for people on social security benefits or students were not advertised originally. If you have already paid full price and wish to receive this discount please contact IA for a refund or speak to us at the door.